Two days before the end, I sat on a stool next to the armchair where Mom lay. When she leaned toward me, I leaned in too, afraid I’d miss what she’d say with her disappearing voice. “I don’t know how to do this,” she said, looking at me with eyes that were searching but unfocused. My own words worked their way past a lump in my throat. “I don’t know how to do this either,” I said. And then we just sat there and breathed together, our foreheads nearly touching as we imagined this great gaping space in front of us that neither of us knew how to navigate. She was soon to cross over into the afterlife. I was soon to cross over into the land of motherless daughters. Neither of us had any idea how we would make the journey. Neither of us had any advice or platitudes or ways of fixing this. Neither of us could offer to go on that journey with the other. All we had was this empty space… this liminal space… where we could sit together and fix our gaze upon each other and find an anchor in each other’s eyes. Looking back over our 46 years together, that moment was quite possibly the most honest and sacred moment we ever shared. We had no expectations of each other. We had no reason to pretend we were anyone other than exactly who we were. There was no point in acting like we had wisdom or answers the other didn’t have, and no point in clinging to old hurts or misunderstandings that had never been (and would never be) resolved. All of that was stripped away and all we had was this moment… this meeting at the intersection of who we were and who we were about to become. All we had was the space of “I don’t know.” And in that moment, it was the most painfully beautiful place to be. I’ve come to believe that is the most potent space we can meet people in our relationships… the space of “I don’t know”. It’s the place where we shed our expectations and pretences. It’s the place where we reveal ourselves to each other and admit that much of what we think we know is simply smoke and mirrors. It’s the place where we seek no heroes or answers, where we ask only to be anchored by each other’s presence. It’s the place where the true work of holding space can happen. It’s not often that we find ourselves in this space with other people. It’s not often that we are both strong enough and vulnerable enough to offer that kind of space to each other. It goes against every instinct to protect ourselves and to prove ourselves. It takes effort and courage and a whole lot of trust. For those of us who’ve been wounded, marginalized, and oppressed, it’s even more difficult than for those who walk in the world with privilege and more assurance of safety. Perhaps, in fact, it’s the kind of space that some of us only enter in our final days on earth, when we have nothing left to lose. Imagine, though, if more of our relationships found us in such a place. Imagine if you could trust people in your life to hold you and offer you an anchor no matter how much you’ve failed them or betrayed them in the past. Imagine if you could enter more conversations with people without having to posture and protect yourself. We may never find perfection in our quest for this kind of space, but that doesn’t mean we shouldn’t strive for it more often. I like to imagine, for example, what it would be like to intentionally seek to enter that kind of space when there are people working through conflict or reconciliation. What if, for example, those of us who are settlers in this country, could drop our baggage at the door and seek to show up with our Indigenous brothers and sisters in that kind of way, admitting that we don’t know what to do and showing our willingness to seek answers from the liminal space? And what if those who govern our country – our politicians – were willing to stop their posturing in order to sit in that space with each other, people from all sides of the political spectrum admitting that they don’t know the way forward but are willing to plant seeds for the future together? And what if we could do that with our own children? Or our parents? Or our communities? 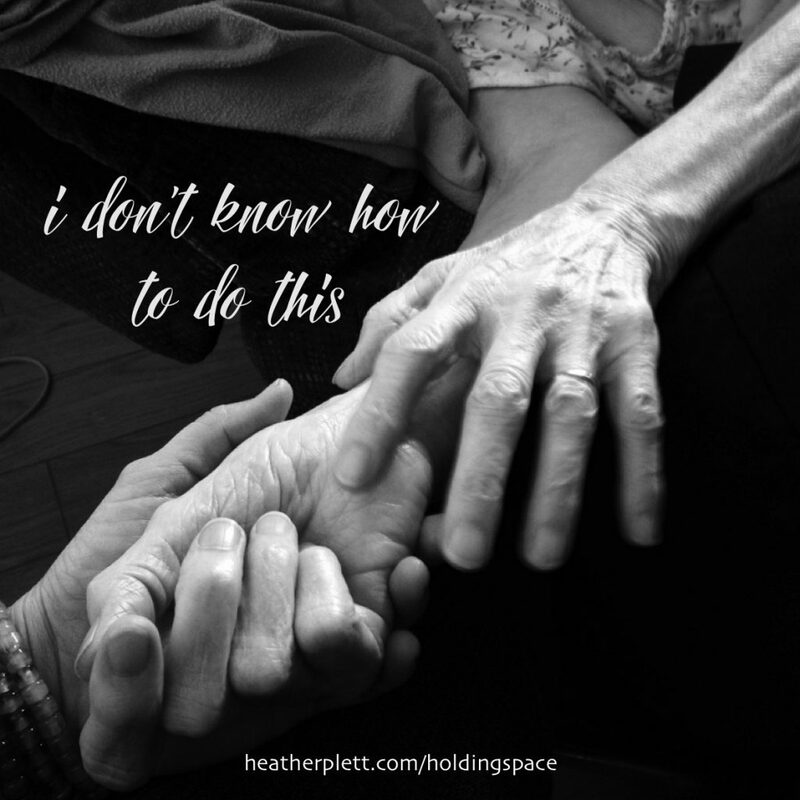 Recently, my friend Beth and I have been practicing sitting in that space together. We have some parallel stories (ie. we’ve both recently ended a 20+ year marriage and we’re raising children around the same age). Plus we’ve both had an increasing awareness of our need, as settlers in Canada, to decolonize ourselves and we’ve had a recent experience together that heightened that awareness. In addition, we’ve been navigating some challenges in a community that is close to both of our hearts. So there is a liminal space element to both of our lives lately, as we evolve in the way in which we show up in our work, our families, and our communities. Beth and I have long conversations over Zoom, where we just talk with little expectation of outcome or even clarity. One of us will text “can we circle up?” and we’ll find time to hold space for each other in a little virtual circle on our computer screens. Often our conversations end on a similar note as we began – still confused as to a way forward. In the middle of it, though, we each find an anchor with which to ground our wobbly selves. We are meeting in the space of “I don’t know”. As we do so, we have to regularly renew our commitment and intention to keep laying down our pretences and instincts toward self-protection. This is not a natural space to be in with another person – it takes effort and humility. We want to impress each other, to prove our value, and we want to make sure we’re safe before we fully trust each other. We have to fight those inclinations in order to offer our vulnerability in such a space. We have too many stories of betrayed trust in the past to rush into an unguarded relationship like this. I am lucky enough to have a few other friendships on similar journeys, and each one of them takes similar commitment and practice. The space of “I don’t know” can never be taken lightly – it is a great privilege that must be fostered and nurtured before it can grow into a plant that bears fruit. But once you taste of that fruit, you find yourself craving more and more of it, and relationships without it become less and less tolerable. And when you lose it, there is a deep grief and a hard journey back to that level of trust once again. The culture most of us live in has conditioned us to resist the space of “I don’t know.” Especially in North America (and I suspect in Europe as well, though my experience is limited), we have attempted to eradicate all chaos and insecurity from our culture. Out of our fear of uncertainty, we turn toward authoritarian leadership that, we believe, will keep us safe and always know how to make the path clear in front of us. We want assurances and safety and so we surround ourselves with people who look like us and talk like us. We resist the risk of engaging in spaces that make us feel like we don’t know what we’re doing, and so we marginalize those people who potentially bring that kind of risk into our lives. But we can never live fully secure lives. We can never fully eradicate chaos. Every one of us will face illness, loss, death, and political instability. It’s simply a part of life. And the more we practice becoming comfortable in the space of “I don’t know” the more resilient we’ll become and the more expansive and beautiful our lives will be. I believe (though I am far from an expert on such matters) that there are Indigenous cultures that understand how to navigate this space much more comfortably than those of us from European decent. Having sat in sweat lodges and other ceremonies and conversations with Indigenous people here and in other parts of the world, I have witnessed this invitation to sit in the liminal space, to release our baggage and false sense of our own importance. I have heard words spoken to me in Maori, Cree, and Choctaw that explain these concepts better than any English words I know. In the liminal space, we need that kind of patience. We need the ceremonies and rituals that allow us to stay present for the discomfort. We need the teachers who can model how to stay present. And we need the relationships that anchor us there. I don’t know how to fix much of the political mess in the world. I don’t know how to eradicate poverty or racism or prejudice of any kind. I don’t know how to help a friend whose life has been deeply altered by time spent in prison. I don’t know how to ensure that women can walk in the world without fearing sexual assault. I don’t know how to parent a child with the kind of anxiety I’ve never navigated in my life. I don’t know how to repair the damage when trust has been lost in a community. I don’t know how to navigate the world as a single mom when my children begin to move out of our home. I don’t know how to hold space for a friend or family member whose lives have suddenly been threatened by gang members. I don’t know how to repair the damage that has been done by settlers in my lineage who took what wasn’t theirs to take. Note: This is similar to the content I teach in my Holding Space Coach/Facilitator Program. The next offering starts in June 2018. What wonderful wisdom. How can I receive more?